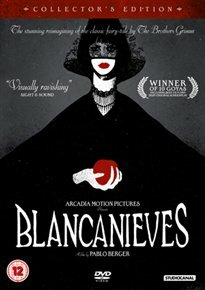 Pablo Berger writes and directs this Spanish black and white silent fantasy drama based on the Snow White fairy tale by the Brothers Grimm. Famous matador Antonio Villalta (Daniel Giménez Cacho) finds his life changed forever when, after being paralysed in the bull ring, his young wife dies in childbirth. Raised by her grandmother until she too dies, Antonio’s young daughter Carmen (Sofía Oria) is then permitted to stay at her father’s new home, dominated by her heartlessly cruel new stepmother, her father’s former nurse, Encarna (Maribel Verdú). Secretly schooled by her father in the bullfighting arts, the now teenage Carmen (Macarena García)’s destiny suddenly changes when, after falling victim to Encarna’s evil plotting, she finds herself rescued by a troupe of travelling dwarf bullfighters.